One MINI primary sensor is required on the same power pack for the MINI-S-PP-FC to function. Refer to tech sheets for part numbers 97180, 97181, 97182 and the appropriate power pack. Up to 4 Secondary sensors may be connected with a primary sensor to increase motion detection coverage. 2-way male to female RJ-12 splitter included. Programmable features cannot be adjusted via the secondary sensors, only the primary sensor. Trim rings are removable for field painting. Use paints suitable for polyethylene plastic. Accessory rings are offered in several popular colors and in two different sizes. Please see accessory ordering information for options. Vacancy (Manual) operation is achieved by combining the MINI primary sensor, MINI-S-PP-FC, and PP power pack with a low voltage momentary contact switch. For high mounting applications please refer to MINI-S-PP-GH-FC, part number 97187. 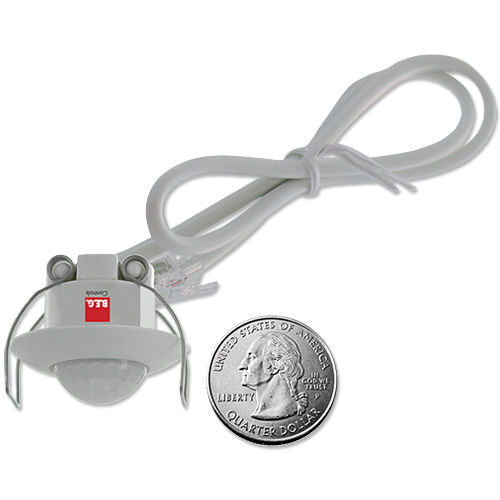 For outdoor and wet location applications please refer to MINI-S-PP-W-FC, part number 97193. Operating voltage: 24 V DC from B.E.G. Controls Power Pack PP-1-J or PP-A-J, or compatible power supply by others. Please contact B.E.G. Controls to confirm compatibility with power supplies by others.